Configuring impersonation for use with Veeam Exchange Explorer. I’m not much of an Exchange engineer anymore, but I remembered something like this in Exchange 2007 when you wanted to do item level restore with EMC Avamar. To get past this, you must grant the account you’ve launched the Veeam managment console with the ability to impersonate the target user. 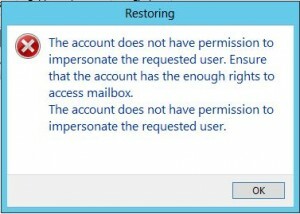 It’s also possible to this on a PER mailbox if you really want, but I’d just reccomend keeping this managment role enabled on your Veeam service account. As a side note…. Exchange Explorer is a pretty amazing plug-in for Veeam 6.5. The features they continue to develop on this software is amazing, especially when you consider its price point.